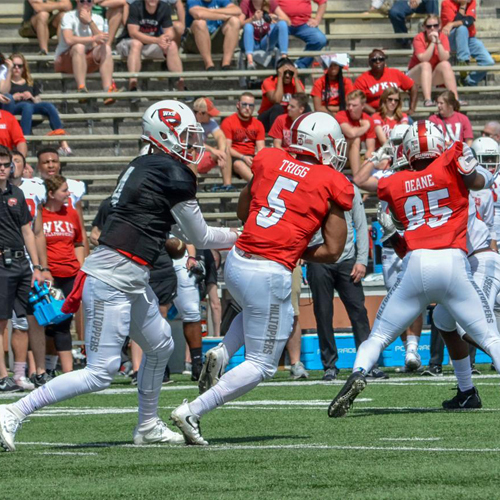 WKU Football will hold a Red & White Scrimmage on Saturday, August 18 at 6:30 p.m. at the new Barren County Trojan football stadium. Representatives from WKU Admissions, Glasgow Campus, Alumni and the WKU Store will have information and giveaways. This is a FREE event for the entire community, so bring your family and friends. Wear your red & white! Gates open at 5:30 p.m. Practice starts at 6, and the players will scrimmage at 6:30 p.m. Coaches and players will have a meet-and-greet with fans following afterward.